To the EMC team Hyatt Ziva will always hold a unique place in our hearts. This is where it all started, only back then the name was Ritz Carlton and the year was 1999. Elite Media Concepts were the exclusive DJs on the property until the Ritz closed its doors in 2013. Under new management, we were not privy to the exclusivity we once enjoyed, in fact, we were not even listed as a preferred vendor! 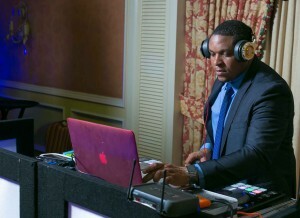 Ayanna had a concept in mind when she pictured what her wedding would be like and the DJ was among her highest priority. Karen Stephenson, wedding manager on site, worked with EMC back in the Ritz Carlton day and she had confidence we would deliver. For Ayanna this was it! 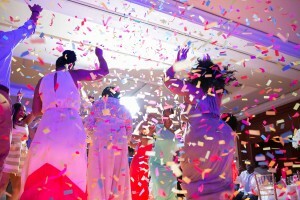 She found the premier DJ and lighting she wanted in Elite Media Concepts. 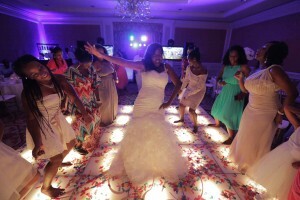 Her was wedding was unforgettable with her guests dancing nonstop under the amazing light show!!! Elite Media Concepts did not disappoint, we delivered!!!!! 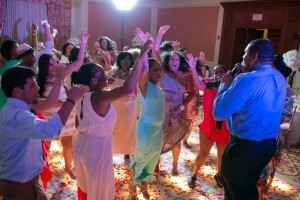 The team exceeded expectations with the ultimate wedding surprise, Ayanna was blown away with our paparazzi services. Her guests were thrilled to see the candid shots of themselves running on screen as they entered for dinner! Thank you Karen for believing in us and for the opportunity to work with you again. Renee Clarke, wedding coordinator, made us feel like we returned home as this was the first time back to property since 2013. Congratulations to Ayanna and Herlitz!!! !